MailerQ is a high performance Mail Transfer Agent (MTA) built to deliver large amounts of email. It enables you to manage a powerful on-premise SMTP server. With MailerQ, messages never have to touch a disk, so you can say goodbye to your expensive hardware and start delivering with higher performance using low-cost servers. 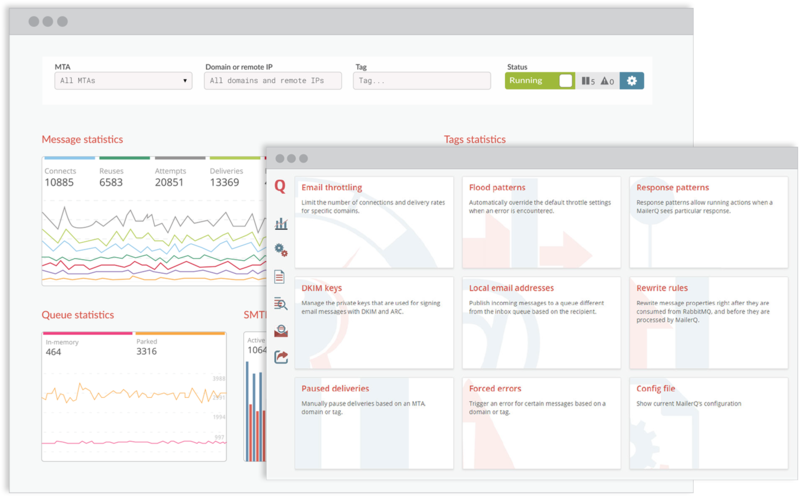 The easy-to-use management console provides real-time insights into all traffic going through MailerQ. MailerQ is fast. It runs multiple parallel threads to deliver email, network calls are non-blocking and messages never hit a disk. MailerQ uses message queues and JSON, giving you full control over your email flow on-the-fly. MailerQ is continuously being developed to stay ahead of the latest developments in the email industry. We understand that your MTA is an important and integrated part of your business. Replacing your old MTA has never been easier with MailerQ. With our team of engineers and MTA integration specialists we will reduce risks involved in replacing your old infrastructure and provide you with cutting edge technology. Could you tell us a bit about your business, how many emails you (plan to) send on a daily/monthly basis, and what mailing platform you're currently using (if applicable)? MailerQ allows us to send much higher volumes at a lower price, be more compliant with ISPs’ requirements, generate very detailed feedback and protect our network and deliverability. One of the major benefits of MailerQ is the fact that managing the system can be done with a friendly interface instead of using the terminal to plunge through endless config files. We have been able to significantly reduce our hardware and maintenance costs whilst simultaneously increasing our monthly traffic. With MailerQ we have gained full control over our e-mail delivery without sharing data of our clients with third parties. Superb e-mail delivery is essential for the community platform that we are building, and that is exactly what got. We regained flexibility and are able to send out thousands of messages per minute without the need to micromanage our sending efforts.